For decades, the United States and the West in general have been facing the barrage of disinformation from the Soviet Union and now from Russia under Vladimir Putin. As a kleptocracy lacking conventional means of international power and influence, Putin’s Russia is increasingly reliant upon nonlinear methods of undermining Western democracies. An amalgam of influence operations allowed Russia the opportunity to shape events by manipulating public opinion. This ability was highly coveted by the Soviet Union, but never achieved during the Cold War. 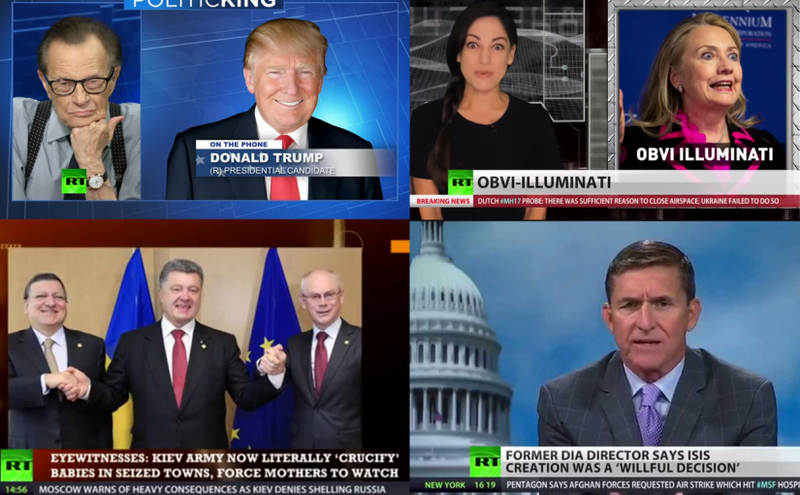 Modern Russia acquired a unique set of tools, allowing hostile actors to blend in with legitimate news sources and opinion-makers. While much of this hybrid war is being waged through hordes of bots, trolls and imposters, one vector of the Kremlin’s influence army is operating in plain sight. Like Trump, Putin is obsessed with television. Observing firsthand the role played by television in the realm of political power, Putin knows the importance of controlling the narrative. Having subdued and defanged the media in Russia, Putin moved on to attacking his external enemies by aggressively influencing public opinion in the West. 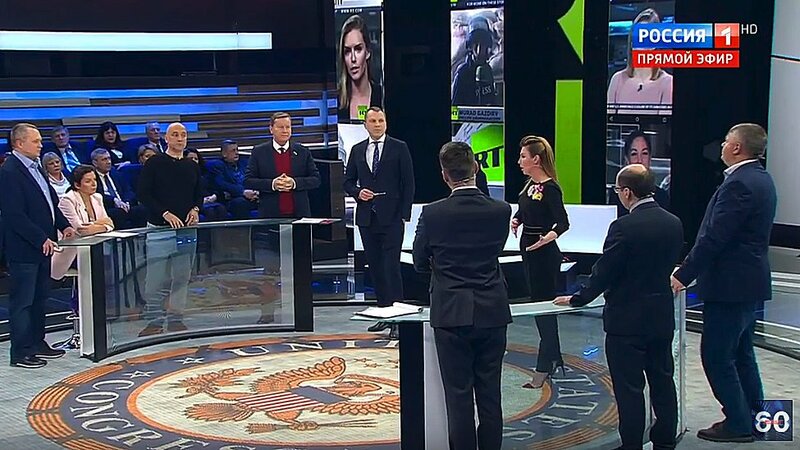 RT’s editor-in-chief Margarita Simonyan described the outlet as an unofficial, “soft power” branch of the Russian Defense Ministry, waging information warfare against western democracies. In another interview, Simonyan denounced the idea of objectivity and described RT as an “info-weapon,” to be used “during critical time periods,” with the U.S. as its “biggest audience.” The topics the outlet covers are “wholly irrelevant to Russia” and are being covered solely to attract Western audiences. “It’s a weapon, like any other,” Simonyan says, to be used in times of war on the previously-cultivated audience. She adds that “during critical moments,” RT will take advantage of this audience that is “used to getting the alternative news” from the outlet. RT and its sister network, Sputnik, drop poison pills into the public consciousness, shielded by the First Amendment. They capitalize on our openness towards the opposing points of view. Under the guise of legitimate news reporting, the Kremlin is targeting the hearts and minds of Americans. The goal of Russian propaganda is not limited to promoting Putin’s revanchist worldview and aggressive foreign agenda. The main objective is to sow chaos, to promote cynicism towards democracy, to foster the sense of disillusionment, making the audience believe they’re powerless to bring about any changes by conventional means, such as civic engagement and voting. Since the effectiveness of Russia’s overt info-ops is being decided in the court of public opinion, perhaps the courtroom approach would be useful in mitigating the damage. The First Amendment prevents democratic governments from limiting freedom of speech, even for the representatives of hostile governments. The Justice Department’s requirement that RT’s U.S. subsidiary and a related production company register under the Foreign Agents Registration Act (FARA) is not an adequate warning. Considering the implications of the disinformation offensive our society is currently facing from abroad, “Consume at your own risk” warning label should be thoroughly, methodically and publicly explained. When someone provides testimony during legal proceedings, the other side will typically challenge their essential credibility. This process of “impeaching” a witness aims to demonstrate to the judge or jury that the person in question doesn’t deserve to be believed. The key aspects of exposing the inherent untrustworthiness of the Russian state media would include the same principles. The duplicity of the Kremlin and its official mouthpieces should result in public perception of these entities as untrustworthy, impeachable messengers with ulterior motives. In a court of law, prior inconsistent statements, character or reputation evidence can be used to demonstrate that the testimony is not credible and should be disregarded. Russia’s blanket denials of military participation in the annexation of Crimea are in sharp contrast with Putin’s subsequent admission that the Russian military indeed took part in the invasion. Recent history is rife with examples of Russia’s malign activities, shameless lies and denials, from the downing of the Malaysia flight MH17 to its interference in the U.S. elections. Instead of simply quoting Russian officials or state media outlets, their propensity for lying should be pointed out at every opportunity. 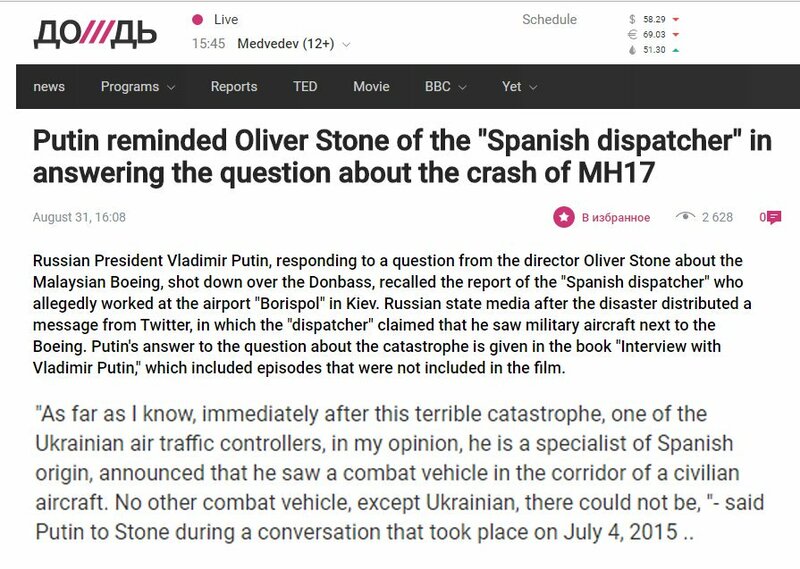 Western media outlets have a responsibility not to simply recite Russia’s talking points, but to immediately mention any available evidence contradicting their claims. Demonstrating bias or personal interest is another way of impeaching a witness in a court of law. Russian government officials, politicians and state media pundits openly admit they’re hoping for the destruction of the U.S. and the EU, are working to undermine transatlantic unity and hoping that the Western economies will crash along with the U.S. dollar. 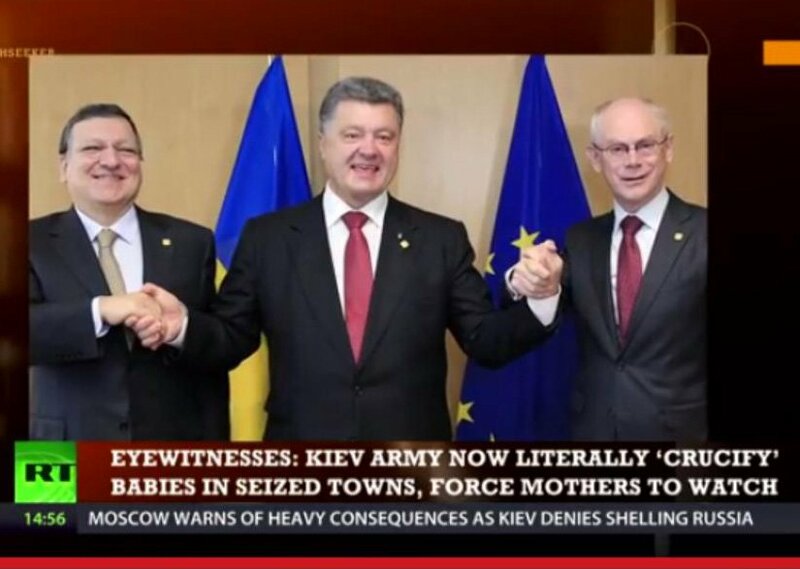 Russia’s rabid anti-Western bias is self-evident. In legal proceedings, criminal convictions come into play to demonstrate the witness’s disrespect for the rule of law. The Kremlin’s lawlessness is blindingly glaring. Murders of dissidents and journalists in Russia are echoed by attacks and assassinations abroad, from Alexander Litvinenko to Sergei Skripal. Russia’s aggression in Ukraine, hacking, election interference, cyber-attacks and other malign activities clearly demonstrate the Kremlin’s disregard for the rule of law. There can be no assumption that the Kremlin or its media barnacles are operating in good faith. Their statements can’t be simply quoted for balanced coverage. They must be closely scrutinized and vigorously challenged. 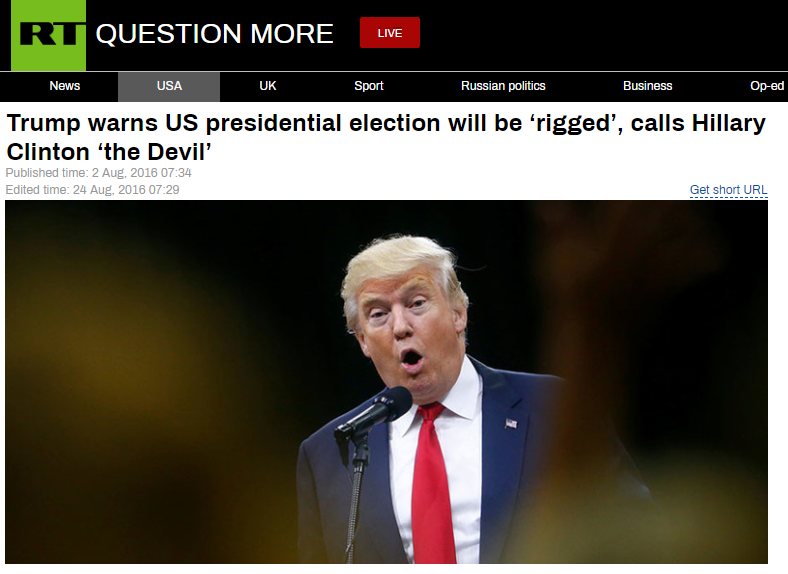 Anything less turns our own media outlets into unwitting tools of Russian disinformation. Information is power. We shouldn’t empower bad information. 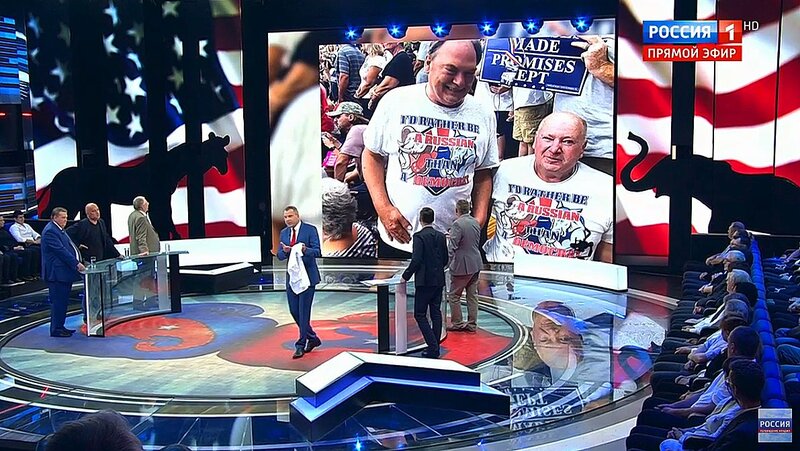 The West should stop feeding the trolls in the broadest term – from Putin to RT and their enablers, foreign and domestic. We should proceed with the understanding that global “news coverage” by Putin’s Russia is nothing more than “maskirovka” – camouflage, mimicry and infiltration of the Western news-scape with intent to cause severe damage. Information disseminated by the Russian state media warrants the same skepticism as the propaganda pumped out by North Korea or Iran, differentiated only by RT’s decidedly sleek, modernized exterior. Judge Russia on par with its allies, based on the Kremlin’s actions and intentions. An important part of disinformation detox requires prefacing any mention of the Kremlin-sponsored content with a disqualifying introduction, based on facts and precedent. According to a Gallup poll released on July 18, 2018, less than 1 percent of Americans consider Russia a top problem for the United States. To paraphrase a well-known quote, you may not be interested in Russia, but Russia is interested in you. From media outlets to everyday citizens, we should tirelessly explain what’s at stake. Ambivalence is a recipe for defeat. As a society facing the Kremlin’s destructive propaganda offensive, we must take active interest in Russia. From government corruption to pension reform, deterioration of living standards, a struggling economy and rampant militarization, the West should be more proactive in exposing the nature of Putin’s destructive regime. The Kremlin is still seething about the late Senator John McCain’s characterization of Russia as “a gas station masquerading as a country.” Russian pundits and politicians rejoiced at the death of “the enemy,” proclaiming there’ll be no others like him. The collective West must prove them wrong by presenting a convincing case to a court of public opinion and winning the battle in favor of democracy.